Knockout Classic Slot Guide & Review - Casino Answers! 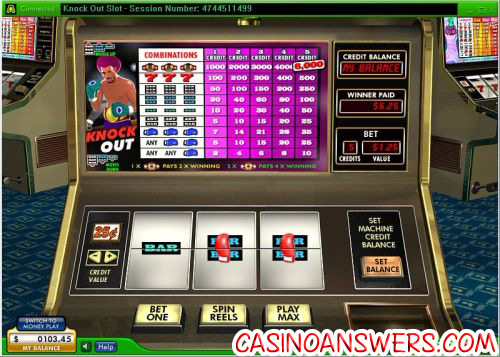 Knockout is a 3-reel, 1-line classic slot machine with special features developed by Random Logic. You can play the Knockout slot machine at Lucky Ace Casino and 888.com Casino.Play at this years #1 online casino for United States - Slots.LV. To play the Knockout classic slot machine, select your coin value at the left of the screen. Available coin values are $0.05, $0.25, $0.50, $1 and $2. The minimum bet on Knockout is $0.05 per spin and the maximum bet is $10. Once you have done that, you can choose how many coins you wish to play (up to five) using the “Bet One” button. Once you’re ready to spin, hit the “Spin Reels” button. To spin the reels using all five coins, hit “Play Max” to make the maximum bet and spin the reels. Knockout has a special nudge feature on many of its bar symbols. On bar symbols with a glove, if the symbol is off by one position and the glove is pointing towards center payline, the bar symbol will move into the center payline. This gives players a greater chance of getting a winning combination. The Knockout slot machine’s championship belt symbol will act as a wild symbol in Knockout. Not only can the championship belt complete a winning combo, bt it will also double it! Even better, two championship belts will multiply your win by 4X. The championship belt symbol is also Knockout’s top fixed jackpot. If you get three belt symbols in a row along the center payline, you will win up to 6,000 coins! Payouts on the Knockout slot machine are as follows (1/2/3/4/5 coin payouts in paranthesis): one glove on the third reel (2/4/6/8/10), two gloves on the second and third reels (5/10/15/20/25), three gloves (7/14/21/28/35), three of any bar symbols (5/10/15/20/25), three single bar symbols (10/20/30/40/50), three double bar symbols (20/40/60/80/100), three triple bar symbols (50/100/150/200/250), three 7 symbols (100/200/300/400/500), three championship belt symbols (1000/2000/3000/4000/6000). The Knockout slot machine has a special betting limit feature. If you have a betting limit that you don’t wish to go over, you can hit the “Set Balance” button to give yourself a limit. You can also set this limit for all other slot machines at the casino. This is a responsible feature from Random Logic that many online casino players can appreciate. Knockout is a decent offering on the part of Random Logic. It has got some nice features, such as the nudging, the wild multipliers and the 6000X top fixed jackpot is a healthy winner’s purse. You can get a 100% up to $200 signup bonus to get in the ring and challenge the Knockout slot in the Lucky Ace Casino arena! Where can American players play the Knockout slot machine? Unfortunately, US players are not able to play Knockout at Random Logic casinos. Instead, we recommend that boxing fans read our Heavyweight Gold iSlot Review for an excellent US-friendly boxing-themed video slot. Is there any boxing based fruit machines?